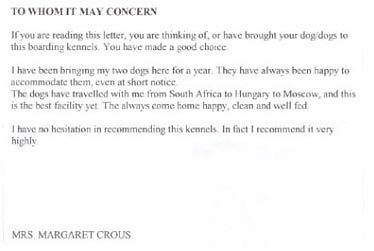 If you are reading this letter, you are thinking of, or have brought your dog/dogs to this boarding kennels. You have made a good choice. I have bringing my two dogs here for a year. They have always been happy to accommodate them, even at short notice. The dogs have traveled with me from South Africa to Hungary to Moscow, and this is the best facility yet. The always come home happy, clean and fed. I have no hesitation in recommending this kennels. In fact recommend it very highly.